Joel A. Merchant, Esq. is a trial attorney with extensive experience representing clients in personal injury and criminal defense matters. He focuses his practice on diligent and zealous representation, and providing quality legal services to each of his clients. Attorney Merchant is a 2016 graduate of Suffolk University Law School, where he earned his Juris Doctorate with a concentration in trial and appellate advocacy. 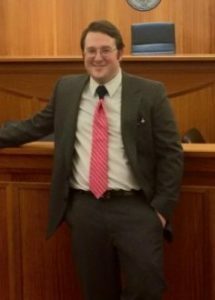 While attending law school, Attorney Merchant competed in and won several mock trial competitions, and was also an active member of the National Trial Team. He also represented indigent criminal defendants throughout the greater Boston area as a SJC Rule 3:03 student attorney with the Suffolk Defender’s Clinic. Prior to earning his law degree, Attorney Merchant resided in central Florida and earned his Bachelor of Arts degree from University of Central Florida. When away from the office, he enjoys skiing and spending time with his family. Attorney Merchant is also an avid Boston Celtics fan and enjoys catching a game whenever possible. Attorney Merchant is presently admitted to practice in the Commonwealth of Massachusetts and is a member of the Boston Bar Association as well as the Massachusetts Academy of Trial Attorneys (MATA).